Cocker Spaniel Dogs - The Cocker Spaniel, also known as the American Cocker Spaniel, is a breed of dog that originated in the United Kingdom and was brought to Canada and the United States in the late 1800s. American Cocker Spaniels were given their own AKC Stud Book in the early 1900s. By 1946, the English Cocker Spaniel was distinct enough in type from the "American" variety, that the American Kennel Club established it as a breed separate from the American Cocker Spaniel. It was given its own Stud Book and that left the "American" type to be known as the Cocker Spaniel in the United States. They are in the sporting breed group of dogs and are the smallest of their group. American Cocker Spaniels were used to flush out birds and prey from the brush so their masters could shoot it. The signature trait of the American Cocker Spaniel is its dark, expressive eyes that reflect a happy, loving, and active nature. 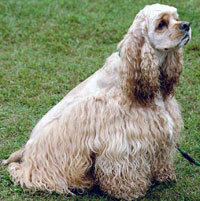 Cockers are a dropped eared breed (pendulous ears) and the mature Cocker is shown in a full feathered, silky coat. Their temperament is typically joyful and trusting. The ideal Cocker temperament is merry, outgoing, and eager to please everyone. They can be good with children and usually sociable and gentle with other pets. They tend to be "softer" dogs who do not do well with rough or harsh training. This information is licensed under the GNU Free Documentation License. It uses material from the American Cocker Spaniel article on Wikipedia.org. Cocker Spaniel Breeders - Advertise your kennel puppies and dogs here. Cocoa's Cockers - Pennsylvania - Blacks, Buffs and Chocolates. Puppies for pet, show and performance homes, most champion sired. Written 2-year health guarantee. Genetic health testing (OFA and CERF) done on all parents. Serendipity's Exquisite Cockers - Nevada - Proud Owners & Breeders of beautiful, AKC registered American Cocker Spaniels. Family loved and raised, bred for soundness, quality, temperament, and beauty. One-year health guarantee with every puppy! TLD Cocker Spaniels - Illinois - Champion Quality Cockers, in the ring or on the couch. Specializing in Chocolate varieties. 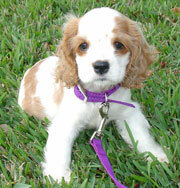 We raise our puppies with excellent dispositions, quality and loving personalities. Tsunami Cockers - Pennsylvania - "Tsunami" is small, hobby/show, cage less kennel. All our dogs are a part of our family. Our goal is to produce high quality, healthy, happy cockers on a limited, but very selective breeding program. All our dogs are OFA and CERF before breeding.